Kevin Wilson couldn’t sign off at Ilkeston with promotion to the newly-renamed National League North but the Robins boss is adamant that was not the outcome his side deserved. 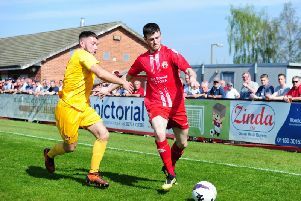 Wilson, who will leave the club this summer, took Ilkeston to the Tameside Stadium to face Curzon Ashton in the Evo-Stik Northern Premier Division play-off final. They found themselves 1-0 down shortly after the quarter-hour mark, following a sluggish start, but roared back into the contest. The Robins could have scored through Rob Duffy, James Reid and Kane Richards, before Curzon’s Joe Guest was sent off late on, but the equaliser never arrived and Curzon were promoted. “Sometimes in life you don’t get what you deserve and I think the second half performance deserved a lot more than we got,” said Wilson. “In the second half I thought we were by miles the better side, but first half we didn’t play well enough and we didn’t pass the ball as well as we are capable of. “It’s going to be a very disappointed dressing room, there are some exceptional players in there and they will go on to bigger and better things but it was a steep learning curve today. “I’m very, very proud of them and they’ve had a magnificent season and with nine players sold from the football club in a year, who knows if we could have kept them.